Step-N-Stor is a system of two or more cabinets (9″ x 7″ x 16″ made of MDF board), that are interlocked with each other cabinet and conform to the shape of the steps as they sit on the stairs. Step-N-Stor is a system of two or more cabinets (9″ x 7″ x 16″ made of laminate or melamine coated MDF board), that are interlocked with each other cabinet and conform to the shape of the steps as they sit on the stairs. 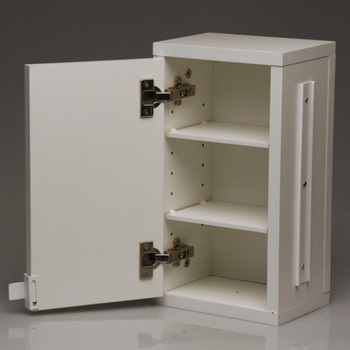 Each cabinet has a male and female interlocking mechanism for locking the cabinets together. 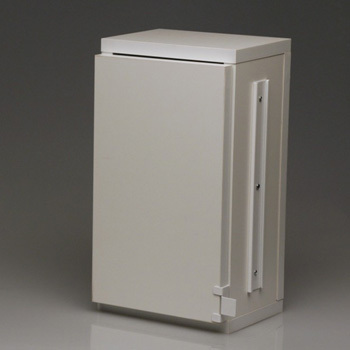 On the top right or bottom left, depending upon which way you arrange the cabinets, is a small sliding handle that doubles as a connector setup for locking the doors together when stacked on top of each other to form the locker feature. Inside are three removable shelves that can be arranged in any number of positions by the many vertical holes along the sides.